A Tuxedo Park native, after high school Lindsey left the Hudson Valley for Connecticut College, where, in addition to international relations and dance, she studied anthropology, with a focus on food sustainability. She moved to New York City a week after graduating and found herself in “every food job imaginable,” from waitressing and wine sales to a cheesemonger gig, all while working at Blooming Hill Farm on the weekends. “I never had a day off back then,” Lindsay laughs. After two years of the grind, she decided to pursue graduate school at The University of Gastronomic Sciences in Piedmont, Italy. Located in the northern Alps, the university was founded by organizers of the Slow Food movement. The global, grassroots group aims to preserve local food cultures and traditions and promotes education among people about the food they eat, where it comes from and how food choices affect the world in general and communities in particular (see Valley Table issue 18). “When it came time for writing my thesis, I researched and wrote about agro-communities in the Hudson Valley,” Lindsay says. “I realized what I was doing was creating the whole idea for The Green Onion in the process.” After graduating, she came home and signed the lease for the building that same week. “I had already known about the space and the farm project that it would be a part of. It was perfect timing,” she says. In the height of summer, the farm market, formerly an onion-processing barn, bustles with life. Nestled between wooden bins of produce on the covered porch, the door (appropriately painted with murals of onions and other produce) welcomes visitors. Inside, a stage in one corner is set for the popular open-mic nights, while a full counter in another accepts orders at the in-house cafe. Specials are hand-sprawled across a giant reclaimed wood-and-tin chalkboard sign that overlooks a sea of tables and yellow-and-grey upholstered chairs. The Green Onion market’s location, surrounded by 270 acres of rich, black dirt farmland, eases the task of helping people make farm-to-table connections. “A majority of the produce we have at the market is right from these fields,” Lindsay says. This season, fruit and vegetables from Rise & Root Farm, Dirty Boots Farm, Sun Sprout Farm and Beet of My Heart are featured at the market. The market and the farms are part of The Chester Agricultural Center, an organization that connects young farmers with land through a 30-year renewable lease arrangement. The Center is transitioning the farmland to organic and sustainable farming practices. 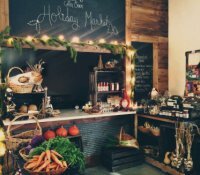 In addition to organic produce, the shop has a growing selection of artisanal and small-batch Hudson Valley products, including jams, maple syrup, coffee and tea, local meat, dairy, baked goods, spices and dried herbs. Brands like Hudson Valley Pantry, Crock & Jar and Lowland Farm contribute to the lineup. “After we opened, people were telling us that they stopped going to the grocery store,” Lindsay says. “It’s super exciting to bring all of these people together around food. Downtown Chester has always been a very sleepy area—we like to think we’re bringing new life and energy.” This new energy is brought not just through the food sold at the market, but through its educational events. Farm dinners, documentary screenings, workshops and more move the agro-community’s mission forward into a shared experience of food, arts and learning. Seated at a table situated around onion crates of local products at the market, Lindsay muses, “For so many people, food is anonymous. We’re creating a holistic approach to food in a place that connects farmers to consumers, helps people see where their food comes from and [helping them] learn the importance of ‘knowing.’ That shows people that food is not a segmented factor of their life, but an integral thing that makes up where they live, who they know and how they eat.